To request a free trial, contact SierraCRM at salesteam@sierracrm.com , or skype at bconvis. Are you automatically sending an email to your customers on their birthday? Do your employees know when Sales Opportunities are at risk of being lost? Does your Support Staff know when a valued account has opened a new Case? Are you using Process Automation to manage the day to day operations of your company? Keep your customers happy, your employees happy, and most importantly, you happy by utilizing Process Automation in SuiteCRM. Interested in trying out Process Manager? Contact us at salesteam@sierracrm.com and we will setup a short demo to show you the power of Process Manager prior to enabling your trial. SierraCRM’s Process Manager 4.5 enables us to do what we do best, service and support our Life Insurance Brokers and not running the day to day operation of the business. The new drag and drop user interface enables us to view the entire workflow in one page and the administration features helps us to better control our business processes. Expanded email functionality permits us to better define when and who receives communications from our company. Process Manager Enterprise 2.0 is a must have for any implementation of Sugar. SierraCRM’s Process Manager Pro has helped decrease work load while increasing productivity. Since implementation we have been able to automate many manual processes that used to take a team several hours to complete. Now it is a matter of seconds. No other product I looked at had the flexibility and feature set of Process Manager. It is doing exactly what I want. A great product, with a dedicated team behind it. We are closing more deals. With this efficient, automated workflow, we get moving quickly on new lead when it comes in via our website. As a result new business is up 15%. 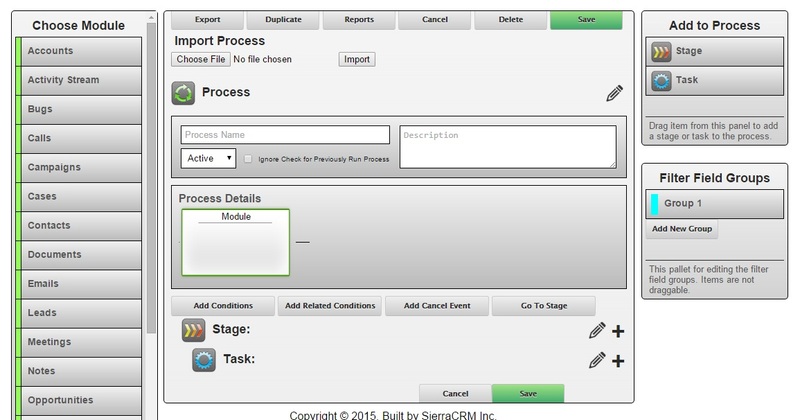 A simple to use, simple to install, simply powerful workflow add-on for SuiteCRM. Automate the sending of emails upon Lead create. Case Create, Sales Closures, and schedule follow-up calls. Assign records to an individual or group or round robin. Escalate a case based on Service Level Agreements. Update related records from a related record - ie: Transfer information from an account related to an Opportunity to the Contacts related to the Opportunity. Call REST Services and pass the returned data to custom scripts. Create a series of tasks or calls that are created when the previous call or task is completed. Support for Custom Modules and Fields. Runs your own custom PHP scripts. And the most important feature - the low cost will make your decision that much easier. Automating your companies business processes allow employees to focus on selling and servicing customers in their most effective manner, utilizing their companies' best practices. Schedule Calls, Tasks and Meetings over time. Run drip email campaigns all year long. Send a Happy Birthday Email to your contacts on their birthday. Capture at risk sales, escalate your cases or calls, convert leads based on your best business practices, create records and assign records, and so much more. There's Plenty That You Can Do! Create easy–to-complex business processes that are triggered to run at anytime. For example, automate sending an email and schedule tasks when new sales leads is created. Alert SuiteCRM users when their participation is required in the closure of a sale or the support of your products. Even more complex business processes can be modeled in Process Manager Enterprise such as setting up a year long drip email campaign where SuiteCRM sends an email to a contact or account monthly along with scheduling calls or tasks each month for follow-up communication to your customers. Every company has 100’s of business processes. With Process Manager Enterprises’s easy to build drag and drop wizard like interface, multi stage processes can be built in no time and deployed to SuiteCRM. Unleash the power of SuiteCRM with PM Enterprise and make sure your SuiteCRM will know what to do and when to do it. Process Manager has been tested on the latest release of SuiteCRM. So no matter the platform you are using, Process Manager will work for you.